Albert King played a huge role in blues music, not only because of his stature standing at about 6 foot 4 inches, but because of his guitar, his voice and his story. 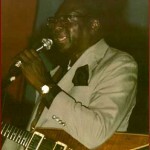 Albert King became known as one of the three Kings of the Blues Guitar, along with Freddie and B.B., and had such hit songs as “Born Under A Bad Sign,” and “Crosscut Saw.” King toured on the road for many years and influenced entire generations of blues guitarists including Eric Clapton and Gary Moore. I found a few video performances that feature King and his band, plus a special appearance with the great Gary Moore. I hope you enjoy the videos! I thought I might as well start out with Albert King’s most popular hit song, “Born Under A Bad Sign.” Check out this performance with his band at http://www.youtube.com/watch?v=BKY8KIt9kqc. Next, King performs with another great blues guitarist, Gary Moore. Together the pair plays a rockin’ version of the classic blues song, “Stormy Monday.” Check it out at http://www.youtube.com/watch?v=6V48_CvbHP8. Lastly, Albert King is in true fashion in this video. Of all the videos in this post, King is the youngest in this one and it’s pretty amazing how he can interact with the crowd. Check it out at http://www.youtube.com/watch?v=h5dpp2iCRwM. Albert King was one of the best blues guitarists to ever play in the style. Even today his music and his playing continues to inspire blues guitarists all over the world. We can be thankful that there are recorded performances and videos for all of us to enjoy and learn from. Speaking of which, I hope you enjoyed all three of the videos in the post today about Albert King! Watching Albert play that Flying Vee brought back my memory of seeing him at Fillmore East years ago. However the sound of him playing his kind of blues remains with me today. When you hear someone like Albert play, you can only hope you can gather all the notes in your head before the rest fall to the floor. I believe I never forget a face I have seen or a note I have heard. I may not be able to duplicate it, but I will search for it forever. A curse and a blessing. Wow… He’s amazing! Thanks for the update! Hey Griff Thanks, love these videos. Think I learned a thing or two just watching. Love your lessons. Keep up the good work. Few notes live in the same pitch, they writhe. Movement in and out of dissonance fascinates. With chord progression a constant, each note has counterpoint, at least implied. Man Love your playing and teaching style. And I loved these videos especially Gary Moore. Thanks again. Albert King is the real KING of the blues.. .but alas I can never be his slave because there`s such a huge difference betwin us …..how I wish I could be just 1% of him….god bless him . Wow! It looks like he’s playing Born Under A Bad Sign with a broken finger! I’m sure he had played it so many time, that he could play it in his sleep by then, but still, a broken finger has to mess you up some. Awesome post! Simply Awesome! Thanks Griff! as an incompetent computer user, I am so grateful there are people out there like you, finding and posting things like this for people like me! Would I be right in thinking he only used two fingers when playing. That is what I thought I saw in the videos.